It's easy to get carried away in the process of creating a wedding registry, but there are a few things even this design-hungry bride can recognize as over the top. 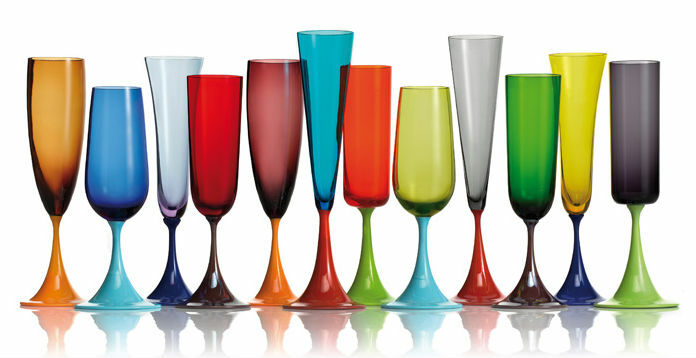 Sadly, Nason Moretti's mismatched set of Guepiere champagne flutes is one of them. Mouth-blown of Murano glass, I can almost talk myself into believing that $1,320 for 12 flutes is not entirely ridiculous (because OMG! PRETTY COLORS!). Almost, but not quite. Once my rational side kicks in, reminding me of my klutziness and the likelihood of shattered glass by our first anniversary, these beauties are removed from the realm of possibility... as if the hefty price tag weren't enough. So, until some miraculous sale, they'll just have to remain off the registry and high on the lust list instead. Giveaway update: Thank you to all who entered the giveaway for a custom clutch from Sew Sarah R. The lucky winner, chosen ranomly, is Amberlicious. Congratulations, Amber!